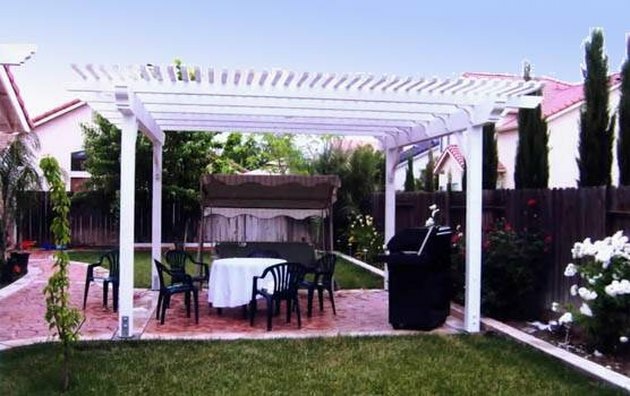 A detached patio cover is one that has four structural support posts and is not connected to a building or a house. A detached patio cover can be built out in the yard over a poolside brick patio or over a carport. Attached patio covers must be approved by the city and permits pulled--a detached patio cover doesn't require the same government regulations. Building a detached patio cover is simple providing you follow the rules carefully. Dig a 12-inch hole in each of the four corners of your patio. Place a 4-by-4 post anchor in each hole and fill the holes in with ready mix cement. Let the cement cure overnight. Attach a 4-by-4 post to each post anchor. Drill a 5/8-inch hole through both sides of each post and insert 1/2-inch bolts to secure the posts to the anchors. Drill the same size holes in the tops of each post. Secure a 4-by-4 post cap to each one with 1/2-inch bolts. Secure a 4-by-8 post from one post cap to the cap on the opposite side. Secure a second 4-by-8 post across the other side of the patio cover parallel to the first. Drill 5/8-inch holes through the posts and secure them to the caps with 1/2-inch bolts. Layout 2-by-6-by-12-foot rafter boards every 16 inches on center, perpendicular to the beginning posts. The ends of the rafters will rest on the 2-by-8 posts. Secure them with 16-penny nails hammered in at an angle, two on each side to prevent twisting. Cover the rafters with 1-by-8 ship lap plywood. Place an 8-penny nail through the ply into the rafter boards to hold them down. Place a nail every 12 inches.